No I'm not talking about Mr Whippy icecream or alien spacecraft. For those who haven't come across the acronyms before before WIP stands for Work In Progress and UFO for Un-Finished Object. Now I used to think these two terms were interchangeable and basically the same thing. When I started my pare down on stuff adventure I realised I was going to have to tackle my incomplete projects at some point. But I've been pretending that point is 'later'. Well I've been running them through my head (instead of actually doing something with them) trying to figure out what to do with them all, and the more I thought about it I began to realise that some of those projects I truly do want to complete and those are the WIP's, then there are those that I don't know if I could be bothered finishing for various reasons or I know for certain that I will not finish (if I'm truly honest with myself - I suffer from delusions of living forever so of course I will finish it someday) and they are the UFO's. Now that I can actually grasp the difference between the two I might actually be able to figure out what to do with all the IP's (Incomplete Projects). IP's that are WIP's must be prioritised for completion or downgraded to UFO's. IP's that are UFO's must be disposed of, put into use as is, or upgraded to a WIP which can only happen by actually working on them. This pearl beaded caul: which I have kind of tied the ends off but I'm not confident that they will hold so I want to secure them further before trimming. BUT, I've lost momentum on this project because I've mentally moved on. I've totally reworked the design so there would be less ends to tie in and fewer 'sewings'. 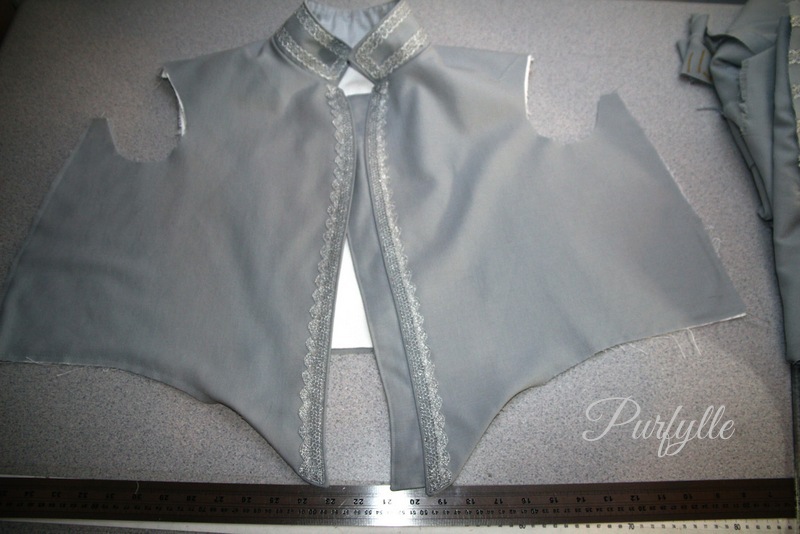 I just need to make a pricking for the new design because the pattern is done. And there's this bit of lace: it's on the lace pillow which I want to dismantle. I haven't made time for lace making lately and that's partly because with the warmer weather I've been doing other stuff and partly because I'm undecided as to what to do with this project. So I'm sulking that my reversing the direction didn't work as well as I hoped *humph* instead of just getting on with finding another solution. But stay tuned, I'll let you know how it all goes eventually. And then there's this: which is based off Dorothea's gown. It's finished! Accept it's not really, there are two or three hook loops that I need to re-sew because they are a bit loose. And then I have to wash and iron it and take photographs. But it's wool. Which means it has to be handwashed and it can't just be thrown in the drier. So it really wouldn't take long to get this from WIP status to completed status. But in my head it's done already, and I love how this gown turned out. So it's just waiting for me to stop procrastinating and do it. I have a lot of other incomplete projects, which is a large part of the reason my sewing room is in need of more attention. I'll share them with you as I sort through my stash in effort to make my sewing space easier to work in. Do you have IP's, WIP's and UFO's or do you actually manage to finish stuff and have an acronym free existence?